A State in a ConstrainedStateSpace, represented as a dense real vector of values. For convenience and efficiency of various Constraint related operations, this State inherits from Eigen::Map<Eigen::VectorXd>, mapping the underlying dense double vector into an Eigen::VectorXd. 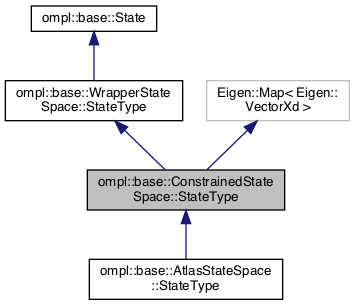 Note that this state type inherits from WrapperStateSpace::StateType, and as such the underlying state can be accessed by getState(). Definition at line 166 of file ConstrainedStateSpace.h.